Thanks to its premium full model range combined with expertised team support, DEM Group is creating a new performing reference in Africa. No more talking about history, future is about technology and adaptability. Each step in infrastructure projects needs a different way of working, our machines are specifically built for AFRICA as per DEM recommendation based on user’s application. Close to jobsite’s operation with DEM mobile technical teams, understanding of application is mandatory to make sure reliable machines match real condition work. Service support comes along with machines supply as a guarantee to end your contract and optimize your operating costs through minimum downtime. Perfectly sized for long years of operation, our Premium Brands have proven field experience so that contractors can focus on their core business and feel comfortable with machine availability. Customizing machines to fit specific needs is in company genetics, creativity gives ideas beyond market standards. 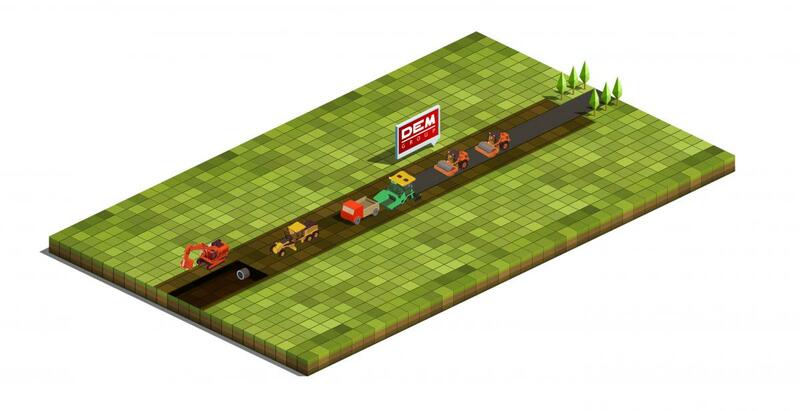 Millions of cubic meters to move, kms of road to profile, DEM is present on your side to offer you a tailor-made solution whatever your expectation is.